She doesn’t see what all the fuss is about but despite her modesty, teacher Isabella Dryden is unique. After four decades in the classroom and in educational planning, she has spent another three decades in retirement – teaching. At 99 years, Miss Dryden has had bestowed upon her all manner of praise, plaques and certificates of achievement. Much has been written about her volunteer spirit since she joined Creative Retirement more than thirty years ago. Even as she approaches her own Centennial, Isabella teaches classes three days a week during Fall, Winter and Spring terms and twice a week during the summer for Creative Retirement. As one of their longest serving volunteers she was awarded an Honourary Lifetime Membership. And that was back in 1996. Now she will have to endure at least one more bout of accolades. On March 23, the Educators of Business and Information Technology (EBIT) will host a special evening at McMaster House in her honour. It has been a long journey for an 18-year-old who arrived in 1937 at a one-room rural school after graduating from Central Normal School. From travelling by horse-pulled buggy to juggling students in grades 1 to 10 through their lessons all the while managing to be the nurse, cook, caretaker and social committee, she’s seen and done it all. 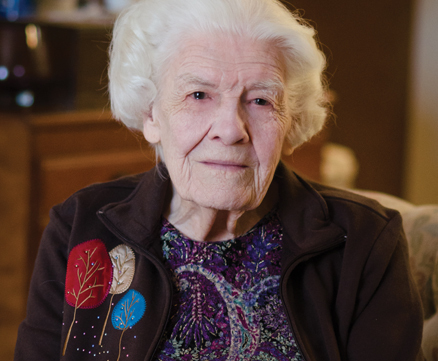 The four years she spent at Errol School near Lenore, followed by another year at Bardal School near Sinclair, Manitoba, provided experiences for a wealth of anecdotes. Many of those stories she tells with a rueful smile and a lasting fondness for those children, while others still bring tears to her eyes. As many teachers know, the first few years can be particularly difficult. “I put a lot of pressure on myself,” she says. “I stayed one year at the second school and I had a breakdown and so I left teaching and moved to Ontario and took an Administrative Secretarial course,” she says matter-of-factly. It has been a long journey for an 18-year-old who arrived in 1937 at a one-room rural school after graduating from Central Normal School. Even as she approaches her own Centennial, Isabella Dryden teaches classes three days a week during Fall, Winter and Spring terms and twice a week during the summer for Creative Retirement. She returned to Manitoba in 1947, first for a year at Ross Consolidated School (two-rooms this time with only grades 1 to 6) and then home to Virden where she settled into the relative luxury of teaching Grade 5 for another year. She says it was a wonderful experience but knowing she had training in that area, the board approached her to teach shorthand, book keeping, economics, law and typewriting. For Miss Dryden, not doing a “good job” wasn’t an option. “I decided I needed my degree and I needed to strengthen my teaching experience in the area of business. I guess it would be for 15 or 16 years every summer I would go to school for special courses.” There were some courses from Bradley University in Peoria, Illinois offered by the Department of Education in Winnipeg, but with no business education courses offered in Manitoba, she attended summer sessions at the University of British Columbia. She spent five more summers earning an undergraduate degree in Business Education at the University of Alberta. Following that, she enrolled at the University of North Dakota to work on her Masters Program. Rather than any kind of linear path, her curriculum vitae becomes a dizzying criss-cross of dates, particularly during the 60’s and 70’s of her many teaching positions, personal studies, and new responsibilities that came with a major shift in her career path in 1967. By then she was the Department Head of Business Education at Virden Collegiate. At the end of one school day she received what began as a rather cryptic phone call. “It was a gentleman from the Department of Education. His name was Mr. Addy. ‘I’m on my way to Virden’ he says. ‘I’d like to speak with you. Are you going to be at the school after classes?’ Anyways, this great tall gentleman came and he asked for a tour of all the classrooms that I used and I thought. ‘What is going on?’ Eventually he said ‘I’ve come to invite you to be a member of the staff of the Vocational Branch of the Department of Education and give leadership in the Business Education Program.” She had two weeks to consider the offer. “I thought about it for a long time and it seemed at though just as one door closes, another opens, so I decided I would join the staff and I worked there for quite a few years.” She led workshops for teachers, wrote curriculum and worked with curriculum committees, all while pursuing her own education. “Later on they asked if I would assist with the curriculum in Industrial Arts, then curriculum in Vocational Industrial Programs as well as the Business Education Programs. It was a lot of hard work.” She gestures widely and lets out a little shriek to evoke the sheer breadth of the tasks set before her. But there was even more to come and her new students would be teachers themselves. At their invitation, she taught both summer and regular sessions through the 1970s at Red River Community College and the University of Manitoba in a new joint Faculty of Education program. She is particularly pleased to have been part of this new initiative, having had no choice but to pursue her own Business Education degree elsewhere over so many years. She has worked with students of all ethnic backgrounds and learning levels but what they have in common is praise for Isabella’s ability to make technology accessible and relevant to their lives. From 2007 to 2010, she taught EAL to International students from some 13 different countries. At her retirement from the Department of Education in 1983, her co-workers made particular note of her many lasting contributions to fellow teachers, especially in helping create Special Area Groups for teachers. Lea Mansell, a long-time friend and EBIT member who is on the organizing committee for the event in her honor confirms Isabella has never missed a Special Area Group (now, Special Area Groups of Educators) conference yet. It is for this unfaltering dedication that EBIT established the IDATE (Isabella Dryden Award for Teaching Excellence) award in 2000. $500 goes to a graduate of the Business/Technology Teacher Education Program. Donations to the scholarship fund can be made through the EBIT website beyond the March 9 registration deadline for the dinner event. All are welcome to the soiree which will no doubt attract fellow business teachers and past students, but likely a few of her current pupils too. Not only has she taught a variety of courses from basic keyboarding to advanced applications using one new edition of Windows after another since 1984, she developed the curriculum. Being a life-long learner isn’t just advice she gives others, it’s a necessity for her own classroom. Just last year, she was asked to lead a class on how to use laptops with a group of seniors through the Chinese cultural centre. She quickly realized that the material was too advanced for their level of English so she went about completely re-writing it all. That dedication and skill in adapting materials and methods to the needs of her students has earned her top marks among senior learners. Warmth, humour and patience is what has always elevated her from instructor to beloved teacher regardless of the age of her pupils. Perhaps her most lasting lesson for everyone who meets her is to embrace life on every level. “Keep yourself active, physically, intellectually and spiritually” she says. Just as she has guided her many students, she says she’s always felt a strong and comforting spiritual presence at her elbow, leading her through one doorway to the next.